ANNOUNCED! The next show is May 1-3, 2020 featuring the US Navy Blue Angels! Thank our 2018 Air Show MCCS sponsors. We hope you were able to make it for eastern North Carolina's biggest, baddest, fastest and loudest outdoor event May 4-6, 2018! 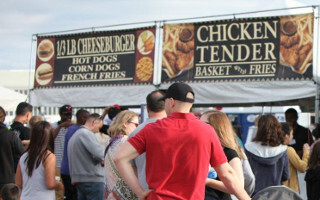 Marine Corps Air Station Cherry Point, the Marine Corps' largest air base, put on another successful Air Show, featuring the world's top aviation aerobatic team, the U.S. Navy Blue Angels. And for the first time ever, the Cherry Point show featured two world-class jet aerobatic teams when the Canadian Snow Birds jet team joined the lineup! It all began with a spectacular night show on Friday, May 4, when the skies and flight line lit up with jet afterburners, wingtip pyrotechnics, sky-diving demonstrations, incredible speed demonstrations by the jet truck Shockwave, plus the crowd-pleasing "wall of flame," all culminating with a massive fireworks display. Despite morning showers on Sunday, the Saturday and Sunday shows featured a dizzying variety of military and civilian aerobatic demonstrations. Air Show visitors got up close and personal with dozens of historic and modern aircraft displays, as well as a wide array of military vehicles and equipment. The show provided children's activities, an outdoor recreational show and much more. Admission and parking, as always, were FREE. The air show narrator walked visitors through a Marine Air Ground Task Force demonstration as air and ground Marine combat forces simulated an assault on enemy positions right in front of everyone's eyes! Individual demonstrations, such as one by the Marine Corps' AV-8B Harrier, made it clear why the Marine Corps is the finest fighting force in the world. And there was a FREE live concert on Saturday night featuring Country Music start Jordan Davis! Always a crowd favorite, the U.S. Navy Blue Angels provided the grand finale both days! The 2018 MCAS Cherry Point Air Show, loaded with hours of great entertainment, tons of good food, and loads of fun (and education) for the kids, was an event for the whole family! It was also an opportunity for Cherry Point's Marines and Sailors to demonstrate the Marine Corps motto - Semper Fidelis - which means Always Faithful. And was their chance to say "THANK YOU!" to our North Carolina neighbors for the fantastic support we enjoy here all year round while we train to remain America's Force in Readiness. Welcome to the East Coast’s Premier Air Show! 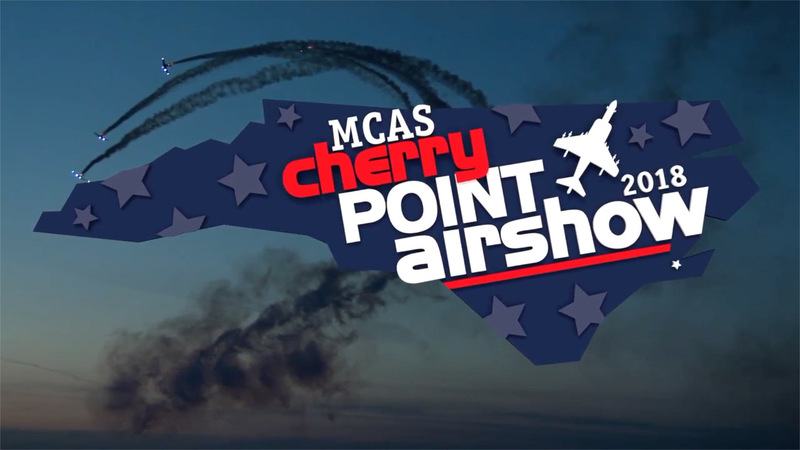 Check back with us periodically as we provide updates for the next MCAS Cherry Point Air Show, which is slated for 2020. Watch this page and on our Cherry Point Airshow Facebook page for our announcement of the actual date late this year. Our success would not be possible without the tremendous support of our 2018 Air Show MCCS sponsors. Next show will be here before you know it! © All rights reserved. No USMC or Federal Endorsement Implied.